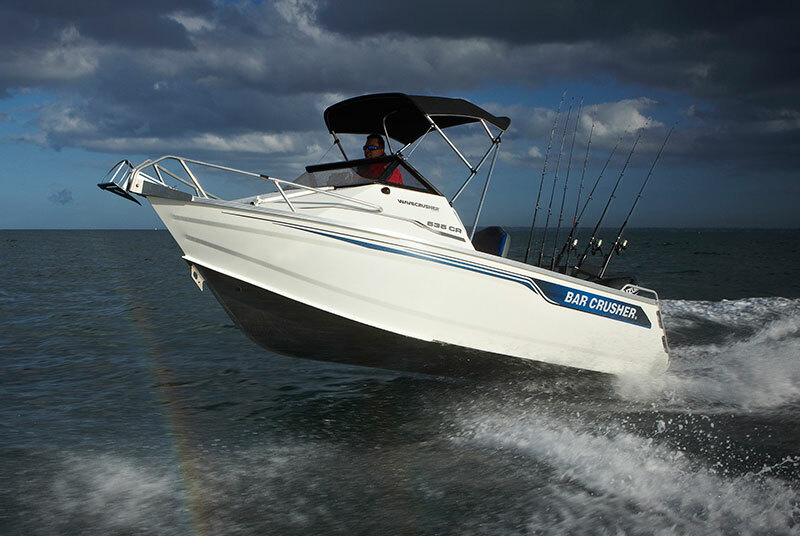 Bar Crusher’s popular 535 hull series has been upgraded to incorporate the company’s innovative Quickflow water ballast technology. Bringing the 535 series – which is available in CR (cuddy runabout), SC (side console) and XS (rear centre console) versions – inline with the rest of the Bar Crusher range, the Quickflow system incorporates a cavity running the full length of the keel that’s open at the transom. This cavity quickly fills with water when the boat is stationary, which lowers the chines into the water for greater stability, and is jettisoned from the hull in seconds as the boat moves forward to allow it to leap effortlessly onto the plane. Bar Crusher director Peter Cleland said the 535 series upgrade extended the versatility of what was already a very capable hull. “We launched the 535 hull as the ‘Wave Crusher’ series back in 2010, a concept which applied the superior engineering of other Bar Crusher models in a range of smaller boats at very competitive prices,” Mr Cleland said. “Constructed from high-tensile marine grade plate aluminium, the Wave Crusher series incorporated the Waveslicer smooth-riding hull and Rigideck sub-floor system for maximum hull strength, but not our Quickflow technology – until now! Stability at rest is significantly boosted with the addition of Quickflow, which allows the boat to take-on several hundred kilograms of water ballast. The added weight and resultant stability is ideal when fishing at anchor for whiting or snapper, slow-trolling livebaits around headlands or jigging over reefs for kingfish. For shallow-water applications, such as casting lures for bream and flathead under the power of an electric outboard, the optional Bar Flap system can be used to keep water out and ensure the boat is easily manoeuvred through tight waterways.